Although Wayne Mansfield made useful connections in the fruit industry as a hawker, he knew little about farming. Fruit Field Farming’s Eureka lemons are harvested from April to the end of August. Before starting his lemon farming operation, Fruit Field Farming, just outside Paarl, Wayne Mansfield was a fruit hawker. “I grew up in Pniel and got involved in the fruit business by helping my uncle after school and over the weekends for pocket money. He’d buy the fruit from local farmers and I’d help pack the fruit to be sold at the Epping market,” he recalls. After school, his father gave him a 1400 Nissan bakkie and he began selling fruit on his own. For Wayne, this was an excellent learning experience. Fairview Wine and Cheese farm, based nearby, supplied him with lemons to sell at the market.“I guess you could say that’s where it all started,” he says. In 2009, Fairview’s manager, Donald Mouton, asked Wayne if he would be interested in farming lemons. Farm manager Michael Parks (left), with Wayne Mansfield and the tractor he was able to buy through CASP funding from the department of agriculture. Still, he rejected the offer. But it prompted him to read books on lemon production, and to speak to several role players in the industry about lemon farming. This was enough to convince him, and when Donald approached him yet again in 2013, Wayne finally committed himself. Fruit Field Farming operates on a 12ha orchard leased from Fairview owner Charles Back on a 15-year term. The lease started in 2013, at which point Wayne applied for Comprehensive Agricultural Support Programme (CASP) funding from the Department of Agriculture, Forestry and Fisheries (DAFF). “I compiled a thorough presentation for members of the department. Afterwards, I was fortunate to be speedily informed that my application had been approved,” he says. Wayne used the grant money to pay for production costs, such as fertilisation, pest control, root management and wages. At this stage, the infrastructure and orchard needed considerable work, a daunting task, as he had very little knowledge of farming.“The 6,9ha of established lemon trees on the farm required a lot of attention as they had not been pruned for a long time. Some of the roots were growing into the irrigation pipes and these had to be replaced,” he recalls.Fortunately, Charles agreed to fix the irrigation, and made many of his implements available to Wayne. “He helped me a lot, and still does,” he says. Fruit Field Farming orchards are planted to Eureka lemons, and Wayne is in the process of planting 5,5ha of new trees. The water crisis in the Western Cape is a challenge, but he did his homework in good time and this enabled him to plant the trees despite the water shortage. He and his team will be adding a layer of chipped wood mulch to reduce evaporation and assist with water saving. Fruit Field Farming’s lemons are harvested from April to the end of August, and pruning is undertaken in August. Wayne employs eight workers, but during pruning and harvesting about 35 seasonal workers are brought in to help. Many of the farming activities are managed by his farm manager, Michael Parks, but Wayne keeps a watchful eye on the operation, and ensures that he is up to date with what is happening. He is full of praise for his workers and says it is their commitment and dedication that guarantees the success of Fruit Field Farming. Foliar fertilisation starts after harvesting. Wayne follows a fertilisation programme developed by First Fruit Consulting, a specialised service provider to the citrus industry. Preventative spraying for pests, particularly mealybug, scale bug, fruit fly and bud mite, is also undertaken. 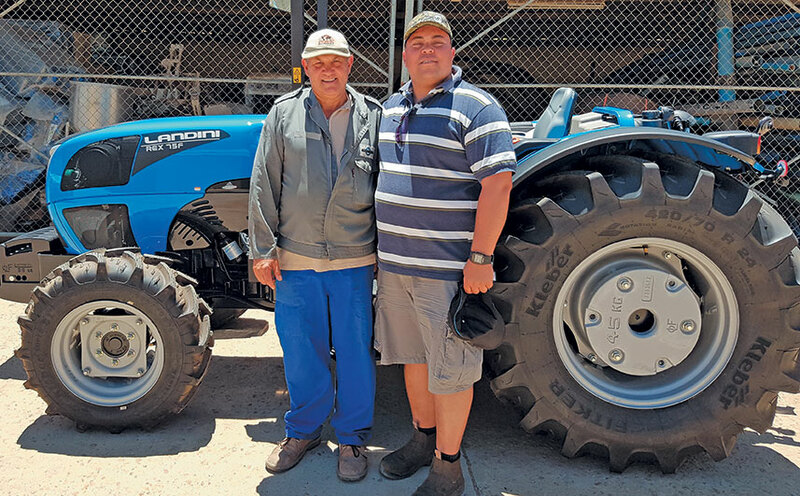 Initially, Wayne had to borrow a tractor from Fairview, but in December 2016, with the help of DAFF, he was able to buy a tractor and spray pump. Wayne exports mainly to Europe, Russia, the Middle East and the Far East. He has a sound working relationship with Unifruit SA, which handles his exports. “One has to always keep up with the changing demands of the different markets, as well as those of consumers. Unifruit SA assists me a lot [in this],” he says. In 2016, Wayne exported his first lemons: a 31t consignment. The following season he outdid himself, increasing this quantity a remarkable 400% to 163t. It’s a milestone that he attributes to good farming practices, as well as the support of and advice from fellow farmers and industry role players. He expects his exports to increase even further in the 2018 season, due to the new plantings. Wayne sends a small quantity of lemons to Cape Fruit Processors to be juiced. He also sells them at the Epping market, as well as to private clients. Fruit Field Farming is still a young business and Wayne is keen to expand his operation to include other crops, such as table grapes and plums. “I’d also like to grow my business further by setting up a packhouse,” he says. Wayne’s advice to new farmers is be disciplined, as well as to be willing to accept challenges. He did not start farming for the money, but for the opportunity to learn the skills, he says. In 2016, he enrolled for a course in mixed farming at the Kaap Agri Academy in Porterville, for which he received a merit award. In the same year, he applied for the two-year SAB Foundation Tholoana Programme, which offers expert mentorship and skills training workshops, as well as access to markets. The programme has helped hundreds of emerging entrepreneurs to accelerate their success. “No matter how well you know your business, if your finances are not in order, you’ll be in trouble. The programme helped me to better understand my business,” he says. Wayne adds that his mentor, Mohamed Majapa from Bora Growth Partners, has been a great support. Email Wayne Mansfield at info@fruitfieldfarming.co.za, or phone him on 083 258 4251.